[ #FMX2014 #vfx ]Check out the video recorded at FMX 2014 which showing how Image Engine used an open source software Gaffer to render the exploding Droid (a 2 million polygons and 150 gb of textures models) from Elysium. 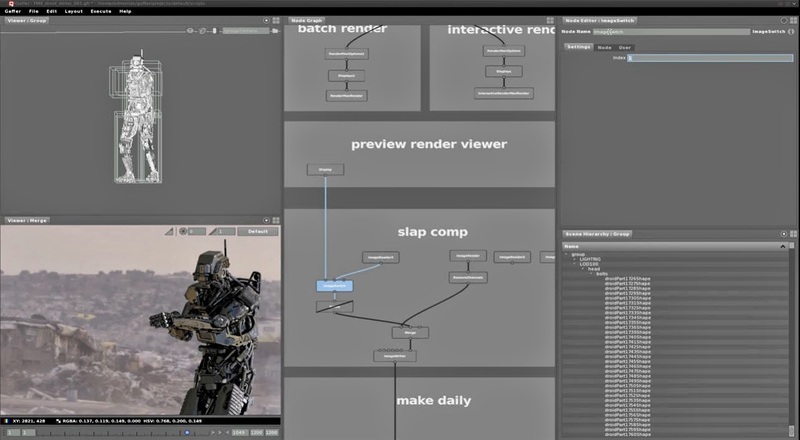 This video demonstrates navigation of a complex scene hierarchy, interactive preview rendering through 3delight, tweaking shaders and light positions live, and finally slapping the render over the original plate. The droid has approximately 2 million polygons and 150 gb of textures. Cortex is an open source project initiated by Image Engine Design Inc. and contributed to by other vfx companies and individuals. The Cortex project aims to provide a set of high quality C++ libraries and Python modules tailored for software development in the visual effects industry. Rather than producing end user tools, the project focuses on creating a reusable set of modules of use to TDs and programmers in a broad range of scenarios – allowing them to focus on the more interesting or innovative aspects of development.